This Chicken and Berry Pesto Pasta Salad is a flavorful and easy to make main dish salad. 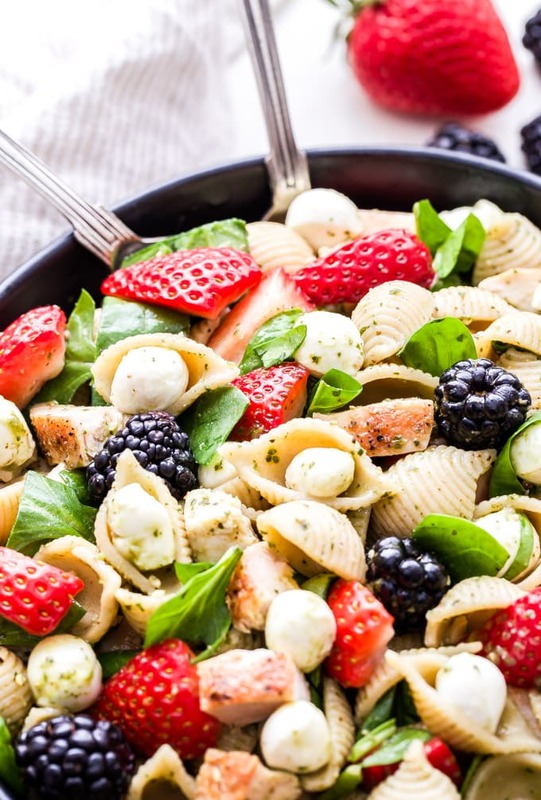 All the flavors of caprese salad, but using berries instead of tomatoes! Hi friends! Danae from Recipe Runner here today. If you love berries, which I’m guessing you do because Ashley has plenty of berry goodness here on the blog, then you’ll love today’s recipe! Chicken and Berry Pesto Pasta Salad, it’s by far the best pasta salad I’ve made in a while. 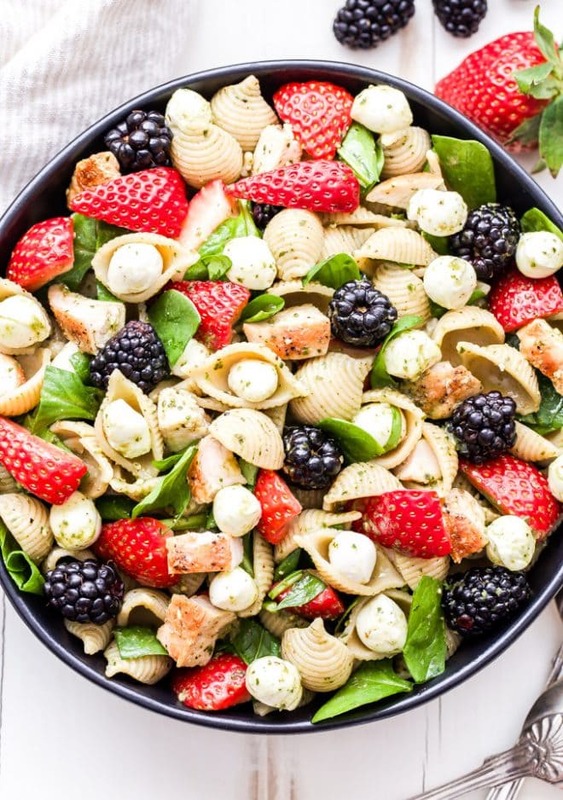 At first glance you might be thinking, berries and pesto? I know, it sounds a little weird, but trust me it works! 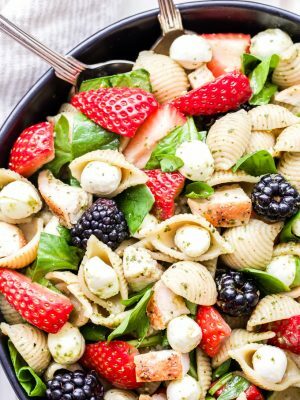 Strawberries and basil are often used together in both sweet and savory recipes, as are blackberries and basil. Since this is a pasta salad and it needed a dressing I thought that using pesto would be the perfect solution. 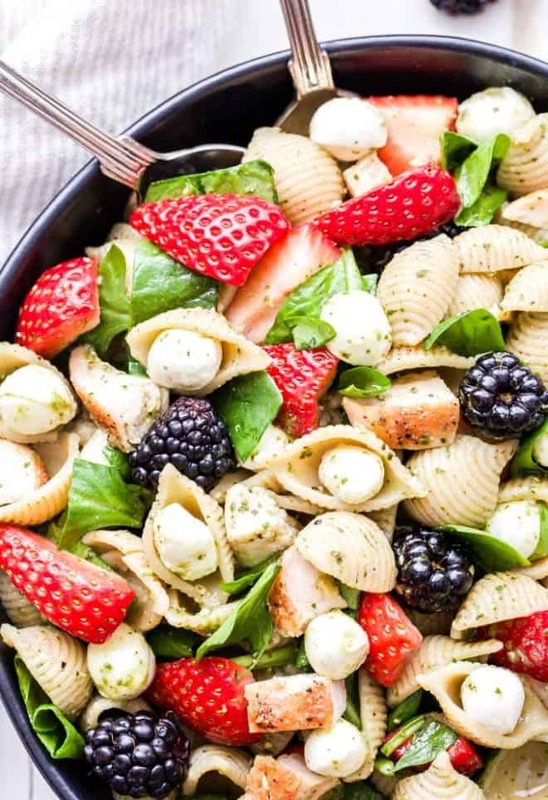 The salad is very reminiscent of a caprese pasta salad in flavor, but instead of tomatoes we’re using berries. I have to say, I think I like this version is a little better. Where there’s a caprese inspired salad, there must be fresh mozzarella. In my opinion, fresh mozzarella trumps the block style any day and I’m a total sucker for the mini pearl sized mozzarella balls. I probably ate three servings of them while I was making the salad. To make this spring/summer pasta salad more of a main dish I decided to add in diced chicken breast. I grilled mine, simply seasoning it with salt and pepper. The grilling added great flavor, but go with whatever cooking method you prefer. If you’re vegetarian or would prefer to make it without chicken, it’s still going to be delicious! 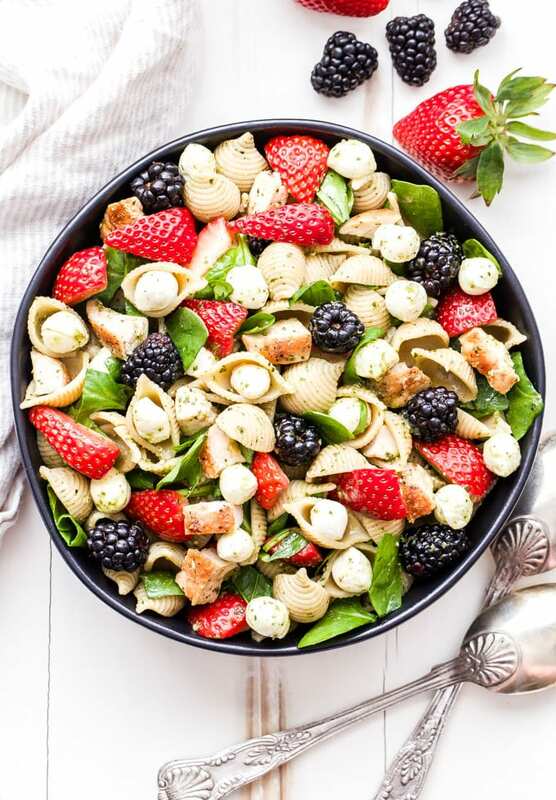 The final piece of this Chicken and Berry Pesto Pasta Salad is baby spinach. 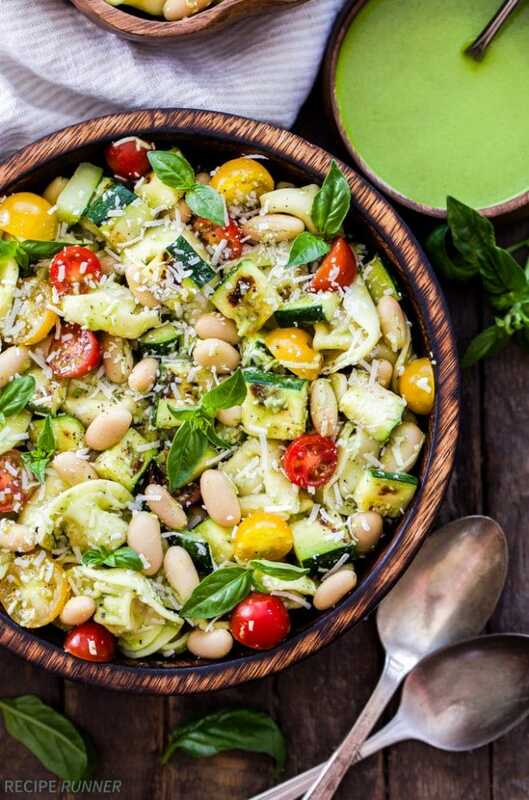 It’s a great way to get some greens and extra nutrition into the dish, plus it adds another nice pop of color. This salad is best made the day you plan to serve it so that the berries and spinach stay fresh and crisp. However, you can cook the chicken and pasta in advance and mix together the dressing. 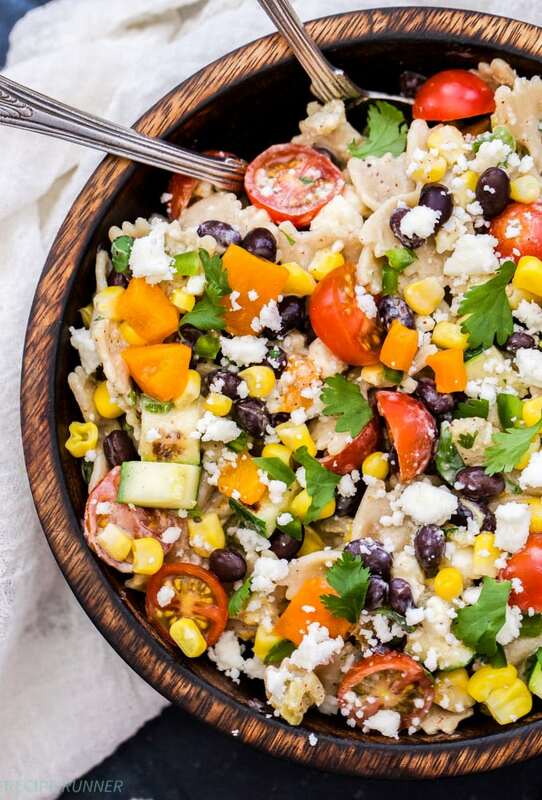 This salad makes a great lunch, light dinner and will be perfect to bring along to a barbecue this summer. Enjoy! Cook the pasta according to package instructions. Rinse under cold water and drain. Add the pasta to a large serving bowl. Add the chicken, spinach, strawberries and blackberries to the pasta. Season with salt and pepper and toss together gently. In a small bowl whisk together the pesto, vinegar and honey. 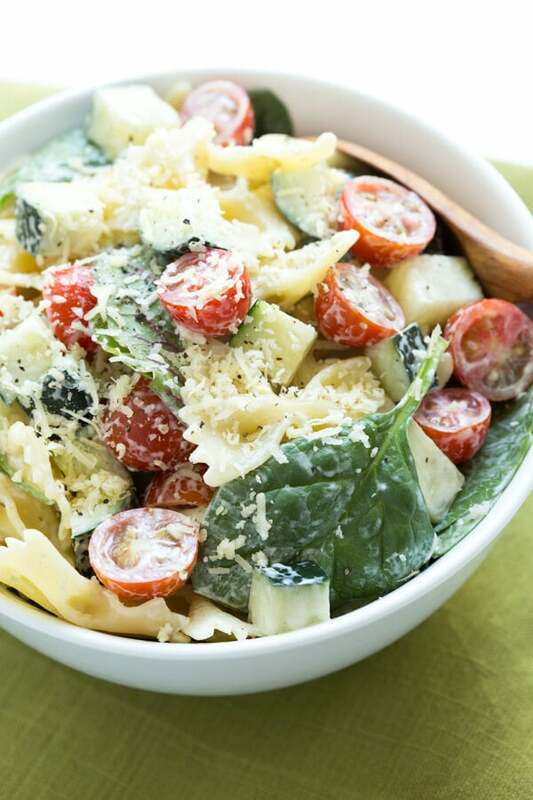 Pour over the pasta salad and toss together to coat. Taste for seasoning and serve. Use gluten free pasta to make this recipe gluten free.